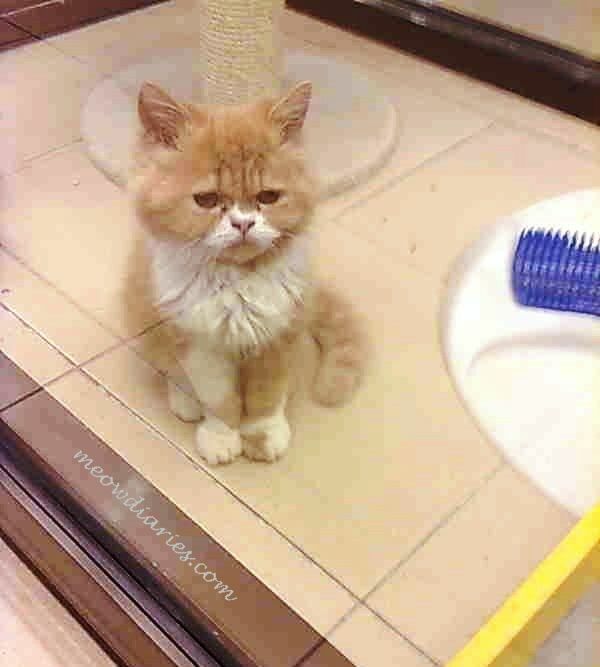 Last week, I saw an adorable gold & white Persian cat in one of my favourite Pet Stores! I love cats that have "white sock paws" and this one has all four white paws so it was mighty cute to me! Naturally B happily took some pictures for me using his phone, which turned out pretty well. Anyway this cat is male and has been given his first vaccination and dewormed as well. He is still a baby and will be 3 months old by the end of July. I thought we could have some fun for this week's Fluffy Friday by having a mini contest. I will keep it simple and since I love guessing games, all you have to do is guess the price of this kitty cat! I've taken a snapshot of the price tag, which I will post when announcing my winner later. Read through my post again for more info on the cat and make your guess. Winner wins 1 FREE Ad Space at Meow Diaries for 1 week. I will put up your badge right at the top of my page above the About Me box. Premium location for my winner so make your guess today! Good luck and have a meow-licious time guessing the price of this week's adorable cat on Fluffy Friday! let's see.. is he around RM1400? I hope i win.. happy FF sweeetie! yeay... Meow 1 for me! wah so much eh? what's the range like? lol! ok BC ok.. ok my guesses..
My my kittens are expensive aren't they? I could not even begin to guess the price, I've never actually paid for a cat, I get the ones no one wants and are going to be put down. Gambar dia tidur tu macam gremlins. Whoaho!! Okay Okay.. saya putar ya..
Saya putar lagi.. Bagi saya wang besar wang besar..
Alahai gambar bawah tu muka dia cute..
=-X =-X =-X =-X he he he he! =-X =-X =-X he he he he thanks for da first guess Mon!